A location full of beauty all its own, Secrets The Vine Cancun is situated by the Caribbean Sea and the Laguna Nichupte with ocean views as far as the eye can see. Each of the Secrets The Vine's 495 guest rooms provide a private and romantic retreat of beauty and splendor with deluxe appointments including Italian porcelain floors, the finest luxury linens and much more. 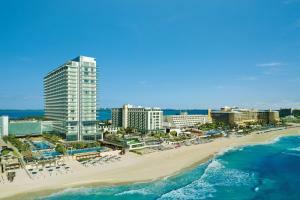 Located only 10 minutes from Cancun's International Airport.